Scott LoBaido, the patriotic artist who paints American flags all over the country, called the vandalizing of one of his flags in the Kensington neighborhood of Brooklyn a “hate crime” when he was told of the incident which took place yesterday. The flag is painted on the side of a linen warehouse owned by John Gentile, resident of Tottenville in Staten Island. The flag covers a 35-foot by 20-foot wall and was painted two years ago at the request of the owner after he admired another one of LoBaida’s flags near his home. Security cameras caught video of the vandal in action. The tape shows a van pulling up to the building at about 1am on Sunday night. Gentile said, “a kid who intentionally came to do this” turned off the van’s headlights, wrote the words “Patriotism Makes Me Sick” in black paint on the flag, and then drove away. The camera was able to record the license plate number of the van. "It's a hate message and a hate crime," LoBaido said. 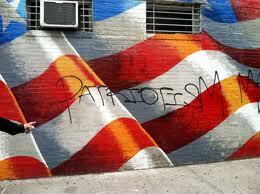 "Once in a while you get a punk who tags a flag. But this is more than that. This was a deliberate act. It is eating me alive." LoBaido is presently in North Carolina painting a flag on a NASCAR vehicle, plus another flag which will be auctioned off for charity. Recently two of his flags were auctioned for $10,000 and $8,900, with the money going towards building homes for disabled veterans. "You bet I'm going to fix it when I get back," said LoBaido.